The hell of Sulfur Onsen (硫黄地獄, iojigoku) is a wild Onsen located in Hakone. It is also one of the onsen springs for Hakone Onsen. 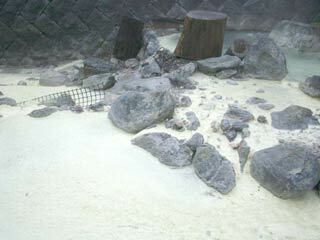 It is strong acid water with sulfur. You can smell of Onsen. Don't touch the spring water because it is very hot! It is not the tourist attraction, so any activity here takes your own responsibility. Never drop any liquid into this spring because it is used public Onsen. There is a warm water onsen spring which you can enjoy foot onsen.